VIP was founded on August 20, 1996 by Graham Milne, a first generation immigrant who married an American and came to live in the US. For over 20 years VIP has focused exclusively on providing the highest quality international communications services. We know that when you are calling the most important people in your world you need great rates, great connections and great customer service. Count on us, every call, every connection, every day – we won’t let you down! We offer great rates on all of our services but we never compromise on quality. Connection quality is a value that we are passionate about because we know how important your calls are! Through our 20 years in business we have built strong and lasting partnerships with the world’s leading telecom carriers to ensure your international calls are always crystal clear. With 100,000+ customers using the VIP service, the same passion for great rates and quality continues to drive the company's culture and philosophy. Our dedication to quality doesn’t stop with our calling services. We understand that there are times when you need to speak to someone to resolve a problem, or maybe you feel more secure using your credit card over the phone than on the web. No matter what your reason, we offer exceptional live customer service, located right here in the US. Our goal is to have the first customer support representative you talk with resolve your issue to your complete satisfaction. 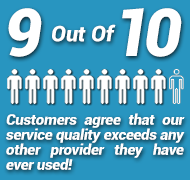 In a recent survey, 98% of our customers were happy or very happy with the live support we provide. We’re proud of this reputation but we won’t be satisfied until the feedback reaches 100%. We attribute our growth to happy customers who continue to refer their family and friends to use our international long distance plans.